Waiter: "Tea or coffee, gentlemen?" 1st customer: "I'll have tea." 2nd customer: "Me, too—and be sure the glass is clean!" (Waiter exits, returns) Waiter: "Two teas. Which one asked for the clean glass?" I make a run at pancakes every now and then for the last few decades. This latest one has come up with a version that meets my requirements (which aren’t entirely mainstream), is so simple I do it from memory, and reheats well. I don’t like “fluffy” pancakes; this recipe came from increasing the egg and milk and decreasing the baking powder in a standard recipe. It’s not much like French crepes, but it’s less fluffy, thinner, a bit chewier than basic American pancakes. A single recipe is plenty for one person plus some leftovers, or two people who aren’t big eaters (or who are having the pancakes as part of a bigger breakfast). And it multiplies easily; a double recipe is two big breakfasts plus some leftovers. By the way, in addition to the microwave, the leftovers can also be heated in a toaster. Dump all ingredients in a bowl and mix with a whisk. Don’t beat to complete smoothness. Doesn’t hurt to let sit a short while before baking (on a griddle). I use about ¼ cup per pancake, but any of a wide range of sizes work fine. I cook these on a non-stick aluminum griddle across two stovetop burners. I set the burners at about 4 and 3 on a scale of 10, whatever that means. Between the non-stick griddle and all the butter in the recipe, I don’t use any oil on the griddle. 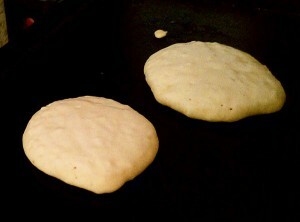 So, the usual pancake thing; wait for bubbles to get quite common, some open, then flip the pancake. Cook a little less time on the second side, and don’t expect it to look the same when done. Leaving the sugar out has no effect that I can see. Leaving the butter out has essentially no effect that I can see. Leaving both the butter and sugar out causes them not to brown much (and that’s why I leave the sugar in the recipe). The quantity of butter is highly variable; I’ve doubled the recipe and not doubled the butter, and I see little effect. I’ve omitted the butter by mistake and had the pancakes come out tasting fine (though not browned; I didn’t have sugar in that batch either). In double batches I rarely put in 6 entire tablespoons of butter, it just feels excessive. I haven’t experimented this time around, but I would be nearly certain that substituting oil for the melted butter would work fine. Basically, I cut down the baking powder and increased the soy milk and vegetable oil. The result was less cardboardy, but still not supple, and they were too thick still. Pamela and Lydy agreed they were as thick as last time, despite more liquid and less baking powder. I’m also rediscovering why I hate gas stoves so much; getting the two-burner griddle to be both fairly uniform and the right temperature (especially since the front and back burners have different size gas rings) is hell, and the only thing one can really adjust based on is the visible size of the flames. These things were sticking to an oiled non-stick griddle until I turned it up a bit. The Smuckers boysenberry syrup is okay, but nothing special. Has more “berry” quality than specific boysenberry flavor. Finally started taking action on the problem of not getting enough pancakes in my life. As it turned out, this required a last-minute trip to the store, since the amount of soy milk in the house was inadequate. I did a batch of vegan whole-wheat pancakes that were okay (better than today’s batch, as I remember it) a long time ago, but don’t seem to have said anything or recorded the recipe. I don’t like “fluffy” pancakes. I like something closer to crêpes. Mix, cook on medium hot griddle, probably greased. Makes 2 servings. These came out kind of okay, though a bit thick, a bit tough, and a bit flavorless (I thought they lacked salt). Turns out baking powder has huge amounts of sodium in it, when used in this kind of quantity. Today’s recipe had 42% of the allowable sodium intake for a normal diet. In the long run I’ll play with grains, I think, and maybe play with vegan egg-replacer. I’m looking for a more rubbery, less cardboard, kind of a texture. More oil might be involved too. I’m trying to limit the number of things I change at once for a few iterations; though I suppose I may eventually give up this recipe entirely. I could give up the vegan route, and work on normal pancakes. But that leaves Pamela out, which seems like it shouldn’t be my first choice.